Lecture in the annual Visual Communication series, with the title “Enlightened typography for a small world”, explaining the link between typeface design and documents that work for global, unknown readers. Describing the challenges for designers, and showing how the risks of marching into unknown type territories are outweighed by the opportunities of fascinating knowledge, and the space to innovate in ways that change peoples’ lives. Two visits at the Centre for Chinese Font Design and Research, hosted in the offices of Founder Electronics, focused on design issues in fonts for Chinese, design tools and processes, and professional training for multi-script design. The second of the visits had very concrete aims: orchestrating the localisation of Glyphs into Simplified Chinese, to enable designers in China to experiment with new workflows. An extended visit to Beijing, invited by CAFA and Founder Electronics. Judging the Latin part of Founder’s 8th Type Design Competition with[ ATypI president] José Scaglione. Held every two years, included for the first time Latin typefaces by Chinese designers. The next day, the winners were announced in the National Centre of the Performing Arts (the “Egg”), together with the opening of the TDC61 exhibition, the Chinese leg of the global tour of the annual design competition; and the opening of the “Chinese Type Modern 1919–1955” exhibition with material from the archives of Founder on the transition of Chinese type-making across technologies. 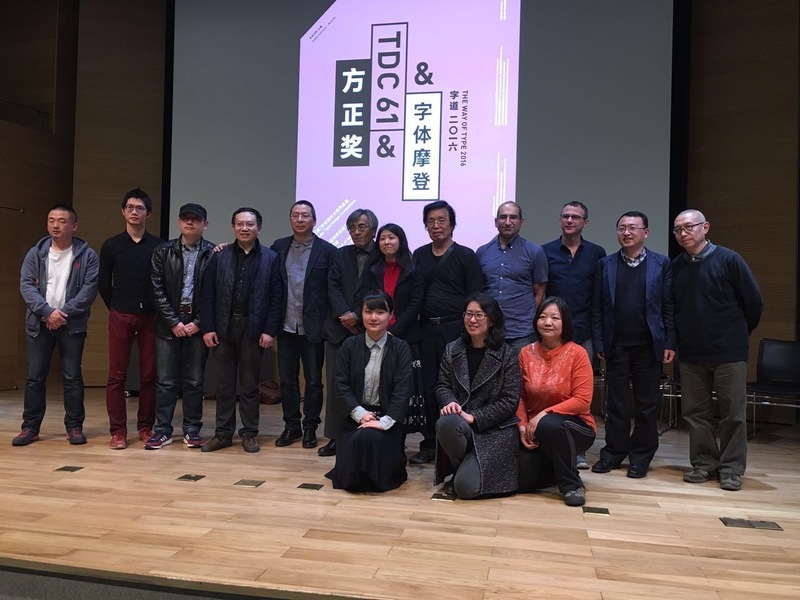 The exhibition and competition awards served as the opening events for the two-day Font Forum, a conference on typeface design with speakers from China, Japan, and Europe. Facilities at CAFA are excellent, making it ideal for an international conference. The main part of the visit was taken over by a workshop on typeface design at CAFA. The interest in Latin typeface design is considerable, and the skills of many students impressive. This is a sign of the gradual globalisation of Chinese design education, and the demands by the local professional employers for skills that can serve markets across language and script regions. Although the workshop was primarily focused on typeface design, there was great interest in typographic design, and especially for mobile platforms. The fourth Granshan Conference on Non-Latin Typeface Design, in Reading – and a celebration of the MATD, with a massive gathering of graduates. Global and intimate, intellectual and relaxed. More here and on YouTube.